The majority of the roughly 4,000 migrants are headed along what some called the "route of death" toward the town of Cordoba in Mexico. ISLA, Mexico — Thousands of wary Central American migrants resumed their push toward the United States on Sunday, a day after arguments over the path ahead saw some travelers splinter away from the main caravan, which is entering a treacherous part of its journey through Mexico. 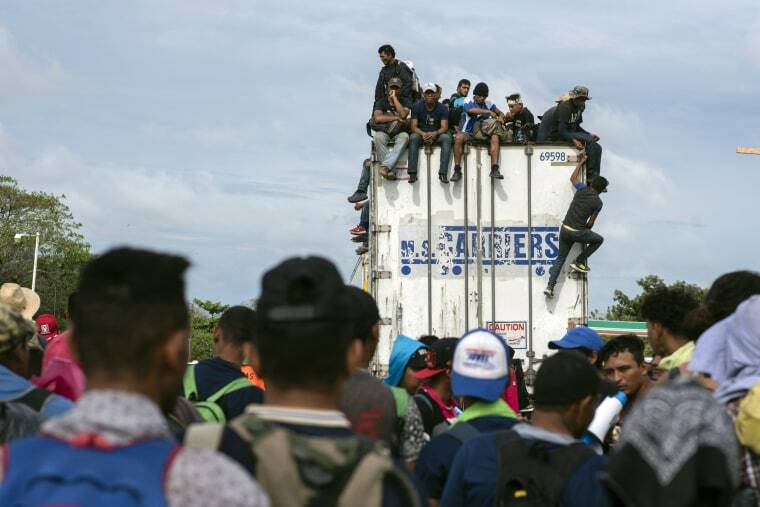 The majority of the roughly 4,000 migrants are now headed along what some called the "route of death" toward the town of Cordoba, in the state of Veracruz, which is about 124 miles up the road. The daily trek will be one of the longest yet, as the exhausted group of travelers tries to make progress any way it can to the U.S. border still hundreds of miles away. But even with the group somewhat more scattered, the majority of migrants trekking through Veracruz on Sunday were convinced that traveling as a large mass was their best hope for leaving their old lives behind and reaching the U.S. The vast majority of migrants are fleeing rampant poverty, gang violence, and political instability primarily in the Central American countries of Honduras, Guatemala, El Salvador and Nicaragua. Immigration agents and police have at times detained migrants in the smaller caravans. But several mayors have rolled out the welcome mat for migrants who reached their towns — arranging for food and camp sites.